In case you’re wondering, I “set up” my iPod about 6 months ago. When this dialog comes up, I have a routine which includes hitting ‘Cancel’ and then going into the iTunes options under iPod and resetting things like “Enable disk use” and resetting all the Photo options, and turning on the syncing of Contacts and Calendars. Again. Posted on Thursday, May 11th, 2006 at 5:00 pm. Subscribe to the comments feed. Both comments and pings are currently closed. Post on your own blog. Which generation iPod is it? Which model Mac do you have, and what version of the OS? Are you plugging it in via USB or FireWire? 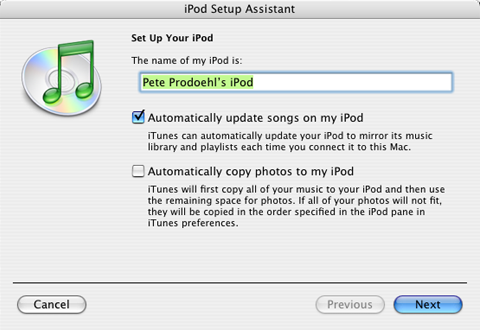 You say that you’ve run the iPod updaters, but have you used the “Update” option or the “Restore” option? If you haven’t used “Restore”, try that. 5th gen iPod with USB. Quicksilver G4 Mac. Mac OS X 10.4.6. I have not tried the restore, I’ll give that a shot.